Any time I’m scrolling and see an outfit I like, I click the little bookmark icon and save the photo. Then when I need an idea for an outfit, I look back through my saved photos and see if I can recreate a look with what I have in my closet. In the same way that creating a Pinterest board helps to define your style, having a few outfits saved helps me see what I’m drawn to – stripes, pattern mixing, dresses and always layers. Some of my favorite outfit ideas come from Musings of a Shopaholic Mama, Courtney Metz, BYBMG and What Nicole Wore. Again, I save pretty tablescapes when I see them – and try to recreate them with things I have on hand! Sometimes I see colors and patterns together that I wouldn’t have combined on my own. It’s so helpful! I love tablescapes from CrispCollective and Victoria Magazine. My favorite magazines to follow on Instagram are: The Cottage Journal, Cottages and Bungalows & Victoria, and I love AllHoneyDesign and Turquoise Lifestyle‘s decor accounts. 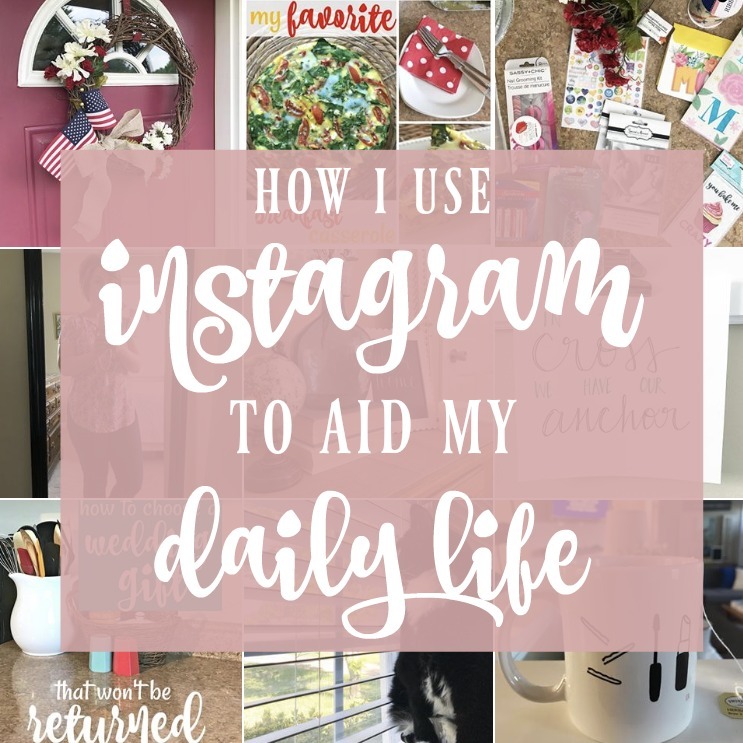 Another way I use Instagram to aid my daily life is by putting my phone down! I’m really working on not being tied to my phone and being present in my daily life. It’s something I have to consciously work on! Instagram is my fave, too! It’s easy to find inspiration, and I love photos. It’s fun to capture moments and share them. The bookmarks feature is pretty new to me, but it’s a good tool! Thank you so much! 🙂 I feel the same about yours! Hmmm, so glad you shared about the bookmark feature! I am going to be using that all the time now! Thanks for the shout out! Instagram is so fun. I need to use the bookmark feature more! Glad to share! I really love your outfits! I love instagram, too! It’s just so fun. I have never really used the bookmark feature so I need to figure that out. I usually screenshot things I like or want to replicate later. I’m with you and love the stories and the recipes being shared. I just wish things would show up chronologically in my feed instead of an odd order that doesn’t make much sense to me.